Company Profile BTB transfer is specialized in designing and manufacturing CNC transfer machines both standard and with special configurations for the processing of different materials, used in the following industrial sectors: automotive, petrochemical, high-pressure hydraulics, valves and fittings, heating and cooling, household appliance, lock and key. After the shot-blasting process, work pieces enter the motorized hopper of an electric plate lift. Through a vibrant tube/channel/passage, they are transported on a backlight band in order to be taken. Thanks to the vision system, a robot takes the printed work pieces and loads them in the processing machine. Any piece that was not taken by the robot comes back to the initial hopper by means of a conveyor belt. The processed pieces are unloaded through a conveyor belt and brought to the metal washing machine. 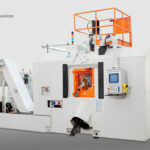 Particularly interesting processings The machine stands out for reliability and precision. These qualities guarantee efficiency over time, making it perfect for medium/large scale production of two/three ways parts. 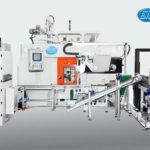 The focus of these technical solutions is to increase flexibility and reliability of the transfer machine. — This process is fit to precise and rapid processing: the robot is equipped with both motorized pliers in order to facilitate the correct fitting of the piece during the sampling/loading of the piece itself and a vision system. Machines and/or equipment and/or employed materials TRO 10S 17U ISO 40 CNEL, Transfer machine with rotary table, horizontal axis, 10 working stations and 17 operating units, fully CNC controlled. — Vision system DRS, anthropomorphic robots, electric plate lift. Characteristics or innovative applications (machines, equipment, employed materials) The indexing of the table and the consequent transfer of the part from one station to the next one, allows to obtain a finished part (once every single chuck have been loaded) at every rotation, masking all the other machining operations. It’s all made possible by splitting all the working operations in more stations. — The robot is equipped with a particular vision system, which is precise and reliable: the DRS (Drive Robot System). The vision system was designed and developed to be able to adapt to the main industrial applications. The electric plate lift is equipped with a connected PLC and it is able to communicate directly with the robot. Application fields The flexibility of this transfer machine is not only guaranteed by the materials that are machinable (brass, lead free brass, iron, steel, aluminium) but also by the applicative sectors in which our transfer machine can operate (automotive, petrochemical, hydraulic, high pressure, fittings and valves, heating, cooling and lock sector). TRO 8S-13U ISO40 CNEL BTB TRANSFER from BTB TRANSFER on Vimeo.